Yesterday was an EXPENSIVE day, though not as bad as it could have been. My car is a 2011 and, all in all, it has been pretty reliable. We’ve had some bad luck in the tire department in the past year, but (knock on wood), we’ve never had any major mechanical issues. All we need to do is regular, routine maintenance and the car has been great for us! So when the brakes started squeaking a few weeks ago, I knew it would be time to replace them soon. But life has been busy with work, school, and the holiday season approaching. I’ve kept putting it off, not wanting to spend the money. Then over the weekend, the brakes progressed from what I would describe as a “squeal” to what I would describe as a “grate.” It was truly an awful noise – the kind that hurts your ears, like nails on a chalkboard. I knew it was time to get in STAT! I called around to a few shops to compare prices and went with a nearby shop that I trust. New brakes, rotors, fluid, and a serpentine belt later, my bill came to $643.28. Ouch! But never forget to Google for coupons! I’d taken my laptop and was working in the waiting room while my car was being serviced. As a last-minute thing, I decided to google coupons for the services I was receiving. And I stumbled across a 15% off coupon, good for all parts and service at the shop I was using! When I went to pay, they scanned the coupon from my phone and my bill dropped to $549.11. BAM! But it gets better still! The brakes I got came with a $50 online rebate. I had to wait 24-hours to enter my information, but I did so today and will be receiving a $50 rebate check in the mail in the next couple weeks. That officially brings my total down to $499.11! Still an expensive day, to be sure, but not nearly as bad as it could have been! And all because I was willing to do a little Google search to find applicable coupons while I waited. No one wants to drop $500 on car repairs, especially around the holidays and at a time when we’re really not doing well financially. But to put things in perspective, $500 amounts to less than 2 months of the old car payment (I paid off the car in January 2016). Since we’ve owned the car an entire 2 years since then free-and-clear, a $500 investment here and there to keep the car in good running order is not too bad. I’m very grateful we no longer have that monthly payment in our list of bills! Have you had any major car repairs lately? Damn I’m jealous! I just had my brakes done. Not even new rotors and one set was $275 after haggling. I still don’t understand why you play around with putting off tires and brakes. So short sighted and dangerous! The wheels are the connection of the vehicle to the road. Without maintaining them you are bound to lose control. I mean is delaying an expense worth paying your car insurance deductible after an accident? Also by waiting too long you end up damaging other parts too. In this case, your rotors may have been spared. I’m particularly sensitive because I’ve been rear ended 4 times. The amount of people driving around with low air pressure, old brakes, and bare tires is staggering. Sorry to sound judgemental I didn’t mean to specifically mean YOU. But it’s a common thing I see with people. I’m frugal and cheap out on a lot of stuff because I don’t want to cough up money for it. But vehicle saftey is non negotiable in my book. So many people don’t take it seriously. Combine neglected maintenance with distracted driving and it’s a recipe for disaster. Yes, brakes need to me taken care of ASAP, especially when children are in the vehicle! Ashley, were you able to cash flow this expense? Hope so! I always hate paying for car repairs. But I usually do them sooner rather than later. Good job on searching for coupons. Any little bit helps! 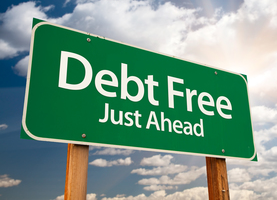 Use this situation as another motivator to tackle your debt. How great will it be when you can fix the car without stressing about it! That’s a great price for those repairs! Way to go on those coupons and rebates. Don’t listen to others giving you a hard time about car repairs. I’m certain your care was safe enough to carry you and your family around. This has been an expensive year for me too for car repairs.